Anarcho-syndicalism is a branch of anarchism which focuses on the labor movement. Syndicalisme is a French word meaning "trade unionism." Anarcho-syndicalists view labor unions as a potential force for revolutionary social change, replacing capitalism and the State with a new society democratically self-managed by workers. Anarcho-syndicalists seek to abolish the wage system, regarding it as "wage slavery," and state or private ownership of the means of production, which they believe lead to class divisions. (Not all seek to abolish money per se. Ralph Chaplin states that "the ultimate aim of the General Strike as regards wages is to give to each producer the full product of his labor. The demand for better wages becomes revolutionary only when it is coupled with the demand that the exploitation of labor must cease.") Anarcho-syndicalism remains a popular and active school of Anarchism today and has many supporters as well as many currently active organizations. Anarcho-syndicalist trade unionists differ on their preferred economic system from Collectivist anarchism to Anarcho-Communism. While distinct from each of these different branches of anarchism, historically most anarcho-syndicalists have been also anarcho-communists (such as Lucy Parsons) or anarcho-collectivists (such as Buenaventura Durruti). Other anarcho-syndicalists preferred mutualist-type economic arrangements such as Joseph Labadie. Anarcho-syndalicism arose during the nineteenth century at a time when capitalism was in its infancy, and the relationship between workers and owners/managers was clearly tilted in the latter direction. Labor's view of the capitalists was that of "coupon clippers" who added nothing to the product. The most dramatic example of this was the popular "labor theory of value" adopted by Marxists among others. As capitalism developed the treatment of workers has improved, in part as a result of pressure from the labor movement. Currently, the labor input as well as management input are generally recognized as part of a product's added value. The basic principles of anarcho-syndicalism are workers' solidarity, direct action, and workers' self-management. Workers’ solidarity means that anarcho-syndicalists believe all workers, no matter what their gender or ethnic group, are in a similar situation in regard to their bosses (class consciousness). Furthermore, it means that, in a capitalist system, any gains or losses made by some workers from or to bosses will eventually affect all workers. Therefore, to liberate themselves, all workers must support one another in their class conflict. Anarcho-syndicalists believe that only direct action—that is, action concentrated on directly attaining a goal, as opposed to indirect action, such as electing a representative to a government position—will allow workers to liberate themselves. Anarcho-syndicalists believe that workers’ organizations—the organizations that struggle against the wage system, and which, in anarcho-syndicalist theory, will eventually form the basis of a new society—should be self-managing. They should not have bosses or "business agents;" rather, the workers should be able to make all the decisions that affect them themselves. Rudolf Rocker was one of the most popular voices in the anarcho-syndicalist movement. He dedicated himself to the organization of Jewish immigrant workers in London's East End and led the 1912 garment workers strike. He outlined a view of the origins of the movement, what it sought, and why it was important to the future of labour in his 1938 pamphlet Anarcho-Syndicalism. In his article Anarchism and Anarcho-Syndicalism, Rocker points out that the anarcho-syndicalist union has a dual purpose, "1. To enforce the demands of the producers for the safeguarding and raising of their standard of living; 2. To acquaint the workers with the technical management of production and economic life in general and prepare them to take the socio-economic organism into their own hands and shape it according to socialist principles." In short, laying the foundations of the new society "within the shell of the old." Prior to the First World War and the Bolshevik Revolution, anarcho-syndicalist unions and organizations were the dominant actors in the revolutionary left. In 1895, the Confédération Générale du Travail (CGT) in France expressed fully the organizational structure and methods of revolutionary syndicalism influencing labor movements the world over. The CGT was modeled on the development of the Bourse de Travail (labor exchange), a workers' central organization which would encourage self-education and mutual aid, and facilitate communication with local workers' syndicates. Through a general strike, workers would take control of industry and services and self-manage society and facilitate production and consumption through the labor exchanges. The Charter of Amiens, adopted by the CGT in 1906, represents a key text in the development of revolutionary syndicalism rejecting parliamentarianism and political action in favor of revolutionary class struggle. The Central Organization of the Workers of Sweden (SAC) (in Swedish the Sveriges Arbetares Centralorganisation), formed in 1910, are a notable example of an anarcho-syndicalist union influenced by the CGT. Today, the SAC is one the largest anarcho-syndicalist unions in the world in proportion to the population, with some strongholds in the public sector. The International Workers Association, formed in 1922, is an international anarcho-syndicalist federation of various labor unions from different countries. At its peak, the International Workers Association represented millions of workers and competed directly for the hearts and minds of the working class with social democratic unions and parties. The Spanish Confederación Nacional del Trabajo played and still plays a major role in the Spanish labor movement. It was also an important force in the Spanish Civil War, organizing worker militias and facilitating the collectivization of vast sections of the industrial, logistical, and communications infrastructure, principally in Catalonia. Another Spanish anarcho-syndicalist union, the Confederacion General del Trabajo de España, is now the third largest union in Spain and the largest anarchist union with tens of thousands of members. The Industrial Workers of the World (IWW), although not explicitly anarcho-syndicalist, were informed by developments in the broader revolutionary syndicalist milieu at the turn of the twentieth-century. At its founding congress in 1905, influential members with strong anarchist or anarcho-syndicalist sympathies like Thomas J. Haggerty, William Trautmann, and Lucy Parsons contributed to the union's overall revolutionary syndicalist orientation. Lucy Parsons, in particular, was a veteran anarchist union organizer in Chicago from a previous generation, having participated in the struggle for the 8-hour day in Chicago and subsequent series of events which came to be known as the Haymarket Affair in 1886. Although the terms anarcho-syndicalism and revolutionary syndicalism are often used interchangeably, the anarcho-syndicalist label was not widely used until the early 1920s (some credit Sam Mainwaring with coining the term). “The term ‘anarcho-syndicalist’ only came into wide use in 1921-1922 when it was applied polemically as a pejorative term by communists to any syndicalists…who opposed increased control of syndicalism by the communist parties.” In fact, the original statement of aims and principles of the International Workers Association (drafted in 1922) refers not to anarcho-syndicalism, but to revolutionary unionism or revolutionary syndicalism, depending on the translation. The use of the term "anarcho-syndicalist" signifies the increasing gap between proponents of orthodox, political Marxism and unionists who advocated complete independence from political parties following the Russian Revolution, and the shift to a more politically doctrinaire version of syndicalism. As a broad ideological heading, prior to the First World War and the Bolshevik seizure of state power in Russia, revolutionary syndicalism grouped numerous left-wing tendencies together united on a class basis with no official party affiliation, as outlined in the Charter of Amiens. The anarcho-syndicalist orientation of many early American labor unions arguably played an important role in the formation of the American political spectrum, most significantly of the Industrial Workers of the World. The United States is the only industrialized ("first world") country that does not have a major labor-based political party. This has not always been the case. In 1912, for example, Eugene Debs (a founding member of the IWW) polled 6 percent of the popular vote as the Socialist Party presidential candidate–a significant portion of the popular vote considering that this was 8 years before the adoption of universal suffrage in the U.S. Some political scientists would, in part, attribute the lack of an American labor party to the single member plurality electoral system, which tends to favor a two-party system. This phenomenon is sometimes referred to as Duverger's law. Controversially, the Confederación Nacional del Trabajo participated in the Spanish Republican Popular Front government in the Spanish Civil War. In November 1936, four anarchist ministers—Garcia Oliver, Frederica Montseny, Joan Peiró, and Juan López—accepted positions in the government. This move was criticized by rank-and-file groups like the Friends of Durruti. Political rights do not originate in parliaments, they are, rather, forced upon them from without. And even their enactment into law has for a long time been no guarantee of their security. Just as the employers try to nullify every concession they had made to labour as soon as opportunity offered, as soon as any signs of weakness were observable in the workers' organizations, so governments are always inclined to restrict or to abbrogate completely rights and freedoms that have been achieved if they imagine that the people will put up no resistance…. Political rights do not exist because they have been legally set down on a piece of paper, but only when they have become the ingrown habit of a people, and when any attempt to impair them will meet with the violent resistance of the populace. Revolutionary Syndicalism basing itself on the class-war, aims at the union of all manual and intellectual workers in economic fighting organizations struggling for their emancipation from the yoke of wage slavery and from the oppression of the State. Its goal consists in the re-organization of social life on the basis of free Communism, by means of the revolutionary action of the working-class itself. It considers that the economic organizations of the proletariat are alone capable of realizing this aim, and, in consequence, its appeal is addressed to workers in their capacity as producers and creators of social riches, in opposition to the modern political labour parties which can never be considered at all from the points of view of economic re-organization. Anarcho-syndicalism is viewed as an anachronism by many contemporary anarchists because anarcho-syndicalists often deny the importance of anarchist groups and federations, arguing that revolutionary industrial and community unions are enough in themselves. Many anarchists see anarcho-syndicalism as "self-managed capitalism," or as John Zerzan describes it, the "self-management of alienation." Syndicalists think that the anarchist and union movements can be fused into one while most other anarchists would disagree. Anarcho-syndicalist Eugene Varlin defended anarcho-syndicalism arguing "the enormous advantage of making people accustomed to group life and thus preparing them for a more extended social organization. They accustom people not only to get along with one another and to understand one another, but also to organize themselves, to discuss, and to reason from a collective perspective," and that unions "form the natural elements of the social edifice of the future; it is they who can be easily transformed into producers associations; it is they who can make the social ingredients and the organization of production work." Revolutionary Syndicalism basing itself on the class-war, aims at the union of all manual and intellectual workers in economic fighting organizations struggling for their emancipation from the yoke of wage slavery and from the oppression of the State. Its goal consists in the re-organization of social life on the basis of free Communism, by means of the revolutionary action of the working-class itself. It considers that the economic organizations of the proletariat are alone capable of realizing this aim, and, in consequence, its appeal is addressed to workers in their capacity of producers and creators of social riches, in opposition to the modern political labour parties which can never be considered at all from the points of view of economic re-organization. Based on the principles of Federalism, on free combination from below upwards, putting the right of self-determination of every member above everything else and recognising only the organic agreement of all on the basis of like interests and common convictions. Thus, anarcho-syndicalism is not apolitical but instead sees political and economic activity as one in the same. And, unlike some critics propose, anarcho-syndicalism is different from reformist union activity in that it aims to completely obliterate capitalism, "(Anarcho-syndicalism) has a double aim: With tireless persistence, it must pursue betterment of the working class's current conditions. But, without letting themselves become obsessed with this passing concern, the workers should take care to make possible and imminent the essential act of comprehensive emancipation: The expropriation of capital." While collectivist and communist anarchists criticize syndicalism of having the potential to exclude the voices of citizens and consumers outside of the union, anarcho-syndicalists argue that labor councils will work outside of the workplace and within the community to encourage community and consumer participation in economic and political activity (even workers and consumers outside of the union or nation) and will work to form and maintain the institutions necessary in any society such as schools, libraries, homes, and so on, Murray Bookchin argues, "[a]t the same time that syndicalism exerts this unrelenting pressure on capitalism, it tries to build the new social order within the old. The unions and the 'labour councils' are not merely means of struggle and instruments of social revolution; they are also the very structure around which to build a free society. The workers are to be educated [by their own activity within the union] in the job of destroying the old propertied order and in the task of reconstructing a stateless, libertarian society. The two go together." Although the organized labor movement has historically been most closely aligned with social anarchists, it has also historically garnered much support from individualist and mutualist anarchists. Individualist anarchist Benjamin Tucker believed that strikes should be composed by free workers rather than by bureaucratic union officials and organizations. He argued, "strikes, whenever and wherever inaugurated, deserve encouragement from all the friends of labor… They show that people are beginning to know their rights, and knowing, dare to maintain them." and furthermore, "as an awakening agent, as an agitating force, the beneficent influence of a strike is immeasurable… with our present economic system almost every strike is just. For what is justice in production and distribution? That labor, which creates all, shall have all." Tucker envisioned an individualist anarchist society as, "each man reaping the fruits of his labor and no man able to live in idleness on an income from capital … become[ing] a great hive of Anarchistic workers, prosperous and free individuals [combining] to carry on their production and distribution on the cost principle." rather than a bureaucratic organization of workers organized into rank and file unions. However, he did hold a genuine appreciation for labor unions (which he called "trades-union socialism") and saw it as "an intelligent and self-governing socialism" saying, "[they] promise the coming substitution of industrial socialism for usurping legislative mobism." Some of the most prominent figures in the late nineteenth century and early twentieth century labor movement, such as Dyer Lum and Joseph Labadie were individualist anarchists. Mutualist anarchist Pierre-Joseph Proudhon believed that worker-owned cooperatives would replace capitalist workplace and mutual banks replacing capitalist institutions and gave fierce support to labor union movements, arguing "every worker employed in the association [must have] an undivided share in the property of the company." Mutualist William Kline believed that labor union movements and cooperative movements would form federations to allow social groups to interconnect with one another for decision-making for the common good, "industries are sisters; they are parts of the same body; one cannot suffer without the others sharing in its suffering. They should therefore federate, not to be absorbed and confused together, but in order to guarantee mutually the conditions of common prosperity … Making such an agreement will not detract from their liberty; it will simply give their liberty more security and force." 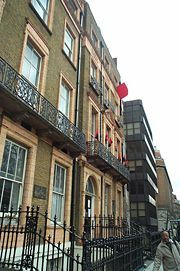 The "London Social Centre," a squatting action by anarcho-syndicalists in Russell Square that ended July 1, 2006. ↑ Georges Sorel, Political Theorists in Context (Routledge, 2004), 248. ↑ Ralph Chaplin, The General Strike for Industrial Freedom (1933), 6. ↑ Geocities, A.3 What types of anarchism are there? Retrieved January 11, 2009. ↑ Rudolf Rocker, Anarcho-Syndicalism: Theory and Practice (AK Press, 2004), 73. ↑ J. F. Jameson, The American Historical Review (American Historical Association, 1895), 731. ↑ Salvatore Salerno, Red November, Black November: Culture and Community in the Industrial Workers of the World, 69-90. ↑ Libcom, Mainwaring, Sam, 1841-1907. Retrieved January 11, 2009. ↑ David Berry, A History of the French Anarchist Movement, 1917-1945, 134. ↑ Syndicalist, About Us. Retrieved January 11, 2009. ↑ IWA-AIT, Documents. Retrieved January 11, 2009. ↑ Seymour Martin Lipset and Gray Marks, It Didn’t Happen Here: Why Socialism Failed in the United States (ISBN 0-393-32254-8). ↑ Rudolf Rocker, Anarcho-Syndicalism (London: Pluto Press, 1989), 111-112. ↑ The Principles of Revolutionary Syndicalism, point 1. ↑ Ulrike Heider, Anarchism: Left, Right and Green (San Francisco: City Lights Books, 1994), 4. ↑ Julian P. W. Archer, The First International in France, 1864-1872, 196. ↑ Romero Maura, "The Spanish Case," in Anarchism Today, 75. ↑ Rudolf Rocker, Anarcho-Syndicalism, 53. ↑ Emile Pouget, No Gods, No Masters, 71. ↑ Murray Bookchin, No Gods, No Masters, 121. ↑ Benjamin Tucker, Liberty, 15/4/1881. ↑ Benjamin Tucker, Liberty, #19, 1882. ↑ The Individualist Anarchists, 276. ↑ The Individualist Anarchists, 283-284. ↑ James J. Martin, Men Against the State, 223. ↑ Pierre-Joseph Proudhon, The Principle of Federation, 70, 67, and 72. Chaplin, Ralph. The General Strike for Industrial Freedom. Chicago: Industrial Workers of the World, 1972. OCLC 1843263. Jameson, J.F. The American Historical Review. American Historical Association. 1895. ISBN 0065-8561. Lipset, Seymour Martin, and Gary Marks. It Didn’t Happen Here: Why Socialism Failed in the United States. New York, NY: New York Times Co., 2000. ISBN 0-393-32254-8. Rocker, Rudolf. Anarcho-Syndicalism: Theory and Practice AK Press, 2004. ISBN 9781902593920. Salerno, Salvatore. Red November, Black November: Culture and Community in the Industrial Workers of the World. Albany: State University of New York Press, 1989. ISBN 9780791400890. Sorel, Georges. Political Theorists in Context. London: Routledge, 2004. ISBN 9780203402276. This page was last modified on 19 March 2016, at 15:29.